Merry Christmas from Sweden! 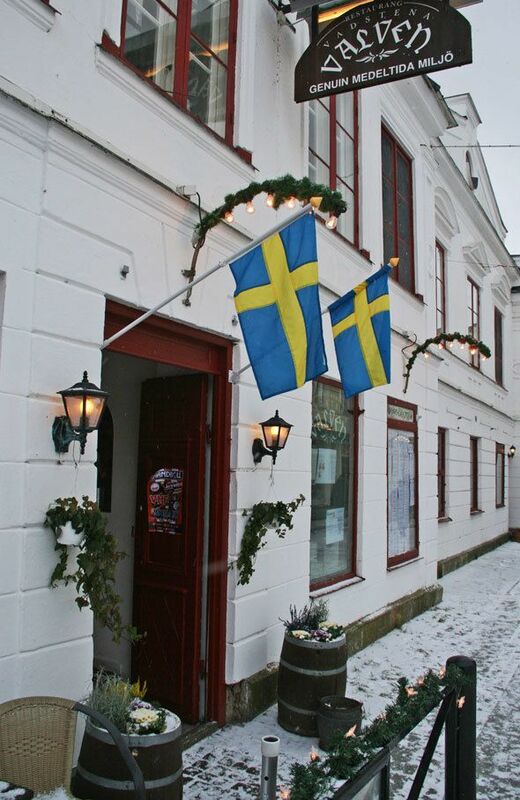 Today I am virtually taking you to Vadstena, Sweden, to see a Swedish medieval town to come to its Holiday glory. It felt like we were inside a Christmas village decorative set, Vadstena is a great little town to feel the old-fashioned “Christmas village” spirit. Vadstena is in Östergötland County in Sweden, by one of the large lakes, by lake Vättern, around 30 minutes west from Linköping where we live. 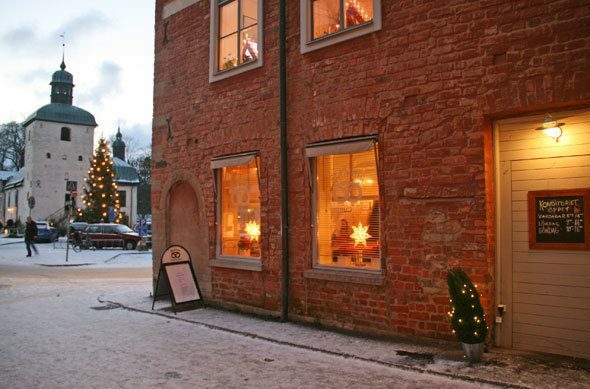 Vadstena is one of my favorite places to visit during summer for the lake views and for boat watching by the guest boat dock by the Vadstena castle, and I would have never guessed that Christmas time in Vadstena even tops the summer. The inner town of Vadstena has keept its medieval street system, and most car drivers know to stay away from the cobble stone streets. Almost every house here is a sight of interest in itself. Very few towns are so well preserved as the medieval town of Vadstena. You know how in the US they create a “Christmas village” of shops only geared towards the Holiday shopping crowd, like the Santa’s Wonderland we visted in Bryan, Texas last year? Vadstena is nothing like it. 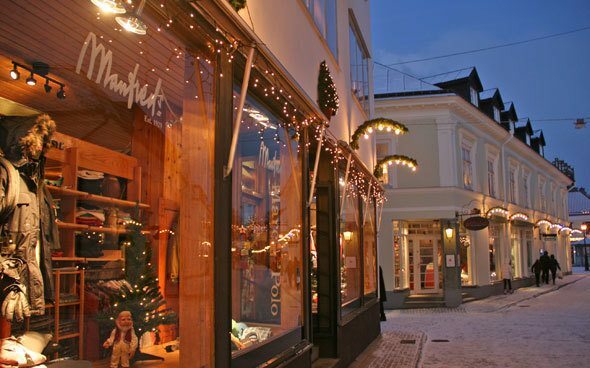 No over-powering amount of Christmas lights, no loud Christmas music, and even the shops are the same ones that are open year round, where the locals and tourists alike shop all year long. It’s a real town, not a make-believe Christmas village, making you oddly feel like dreams come true. 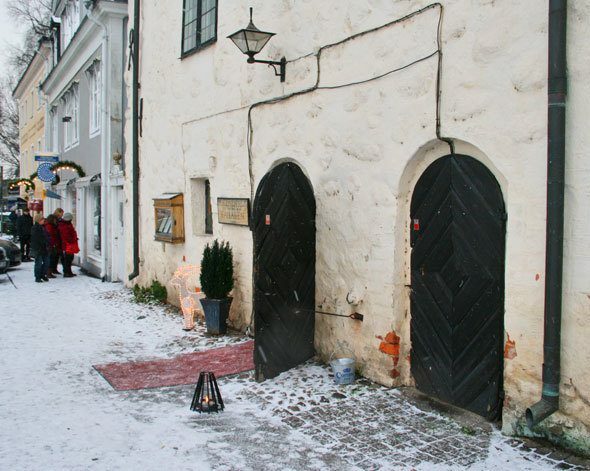 The day we visited Vadstena, it had snowed on the morning, and it snowed a little while we were there, and as I watched the snow fall, I felt like I was living inside one of those beautiful snow globes. In fact, the tourist in my on a staycation visiting a town close to home wanted to buy a Vadstena snow globe to remember the day of. Of course there aren’t ones, because Vadstena while is a tourist attraction, you can’t find the tourist shops, and that’s the entire beauty of it. Vadstena is the real deal. 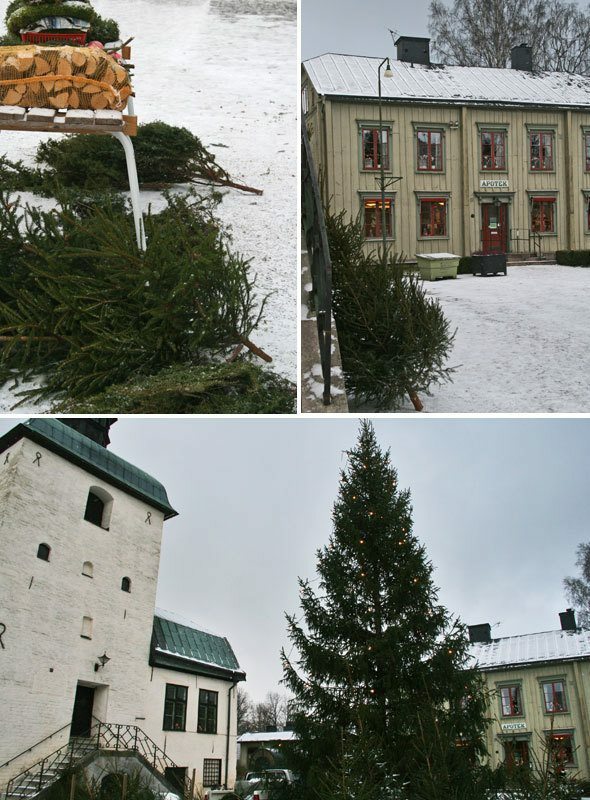 What you could buy from Vadstena though… Christmas trees. They were in the little square nested between the town hall and the Apotek, the old drug store and pharmacy museum. 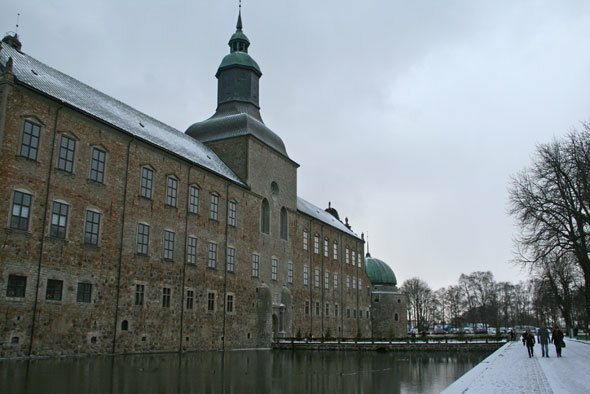 The Vadstena rådhus, the town hall, was built in 1490, and it’s between the town market place and the Vadstena castle. You can find the most charming cellar restaurant in the cellar of the town hall. They were fully booked for the day we visited Vadstena, so we just ate in one of the other many idyllic restaurants in town, in fact cross the street from the Rådhus Cellar, watching the beautiful building and the shoppers walking by. Right down the street is also my favorite bakery and cafe to stop for ice creams during summer and get some bread to take home any time of the year. 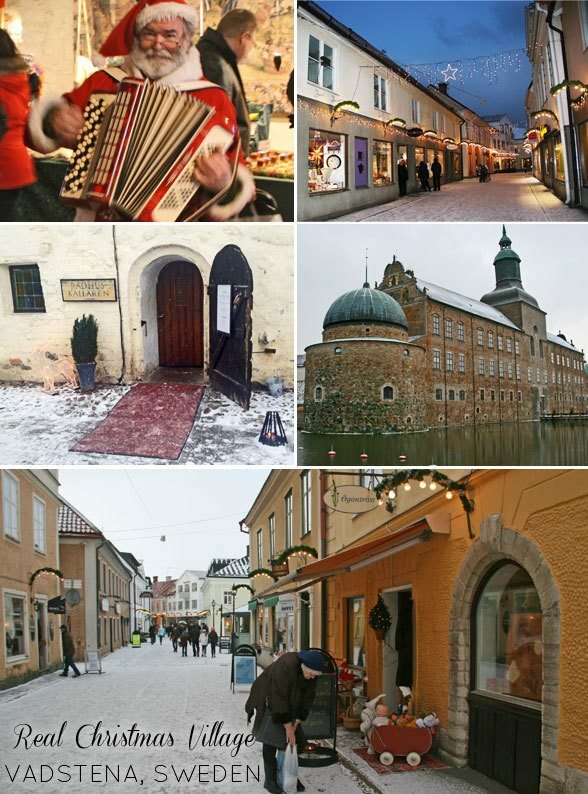 We spend the entire day in Vadstena, Christmas shopping and visiting the Christmas market in the castle (keep reading – pictures from the castle coming too! ), and I was cursing the short Nordic days and it getting dark already early on the afternoon, and I felt like I hadn’t taken enough photos while the lighting was still good. Silly me… the town turned even more beautiful after the dark and as the snow reflected light from the simple Christmas lights. 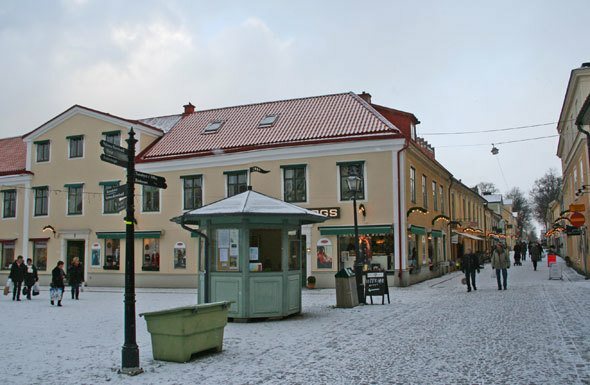 Oh by the way, don’t be fooled by the idyllic store fronts and lack of tourist souvenirs, and think that the shopping in Vadstena isn’t anything to worth mentioning. Quite the opposite. 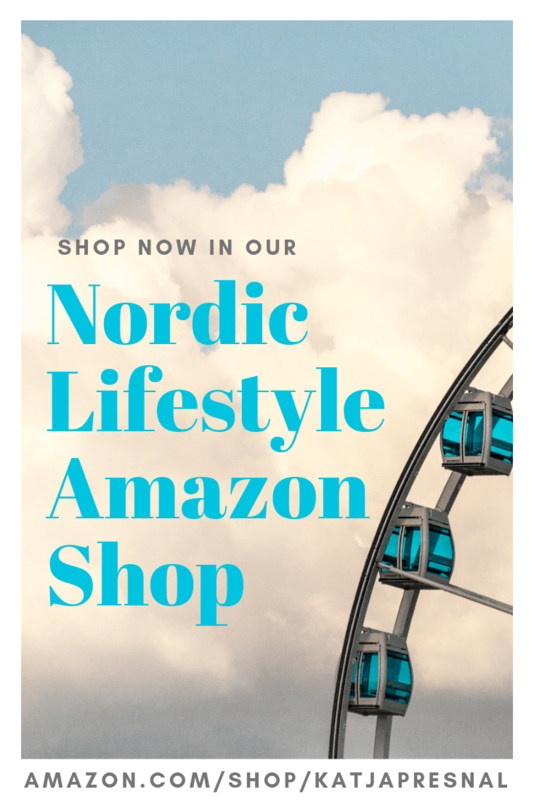 The small stores include design stores with modern design favorites from Alessi to Design House Stockholm and from the clothing boutiques you can find the Barbour jacket and latest from GANT, with better selections than you’d find from your typical mall department stores in the US. It wouldn’t be a real European Christmas village without a castle, right? Vadstena Castle is one of Sweden’s best-preserved castles from the era of Gustav Vasa in the 16th century. 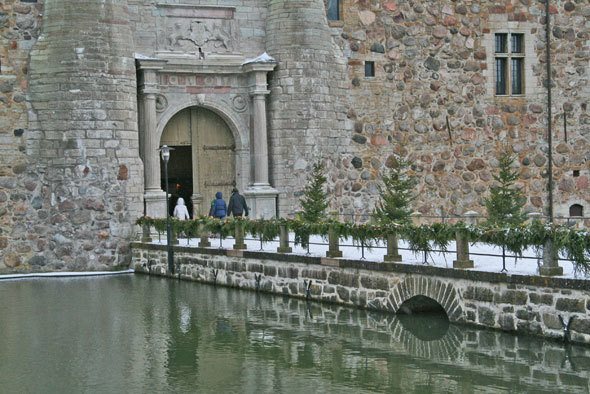 Vadstena castle was built by King Gustav I in 1545 as a fortress to protect Stockholm from enemies from the south. The fortress consisted of three smaller stone buildings facing the lake Vättern, three ramparts, a courtyard, four circular cannons turrets and my favorite: a moat. The moat serves as a guest dock for the boats (even sailboats) of the lake during summer, and it’s quite a sight to see the boats around the castle. 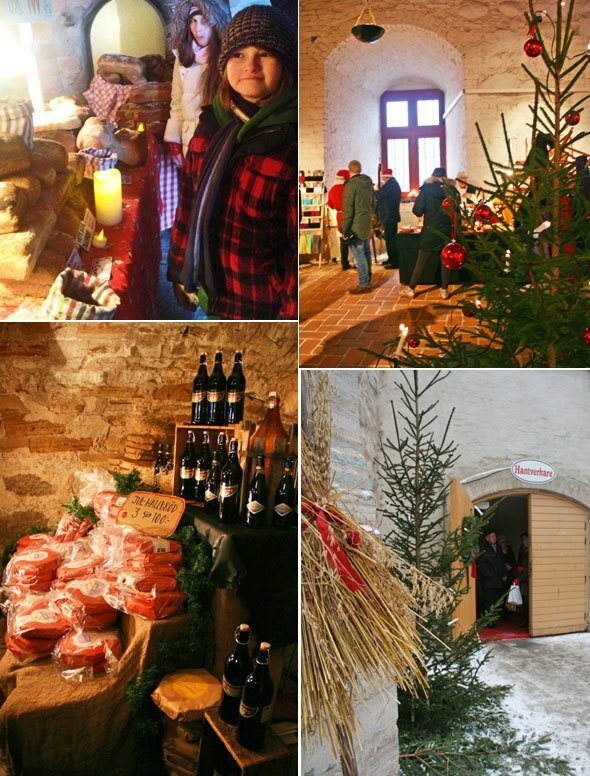 The Vadstena castle Christmas market is a lot like any other Swedish Christmas market, like the one at Ekenäs castle – artisan products, handmade gift items, and glorious Holiday food. 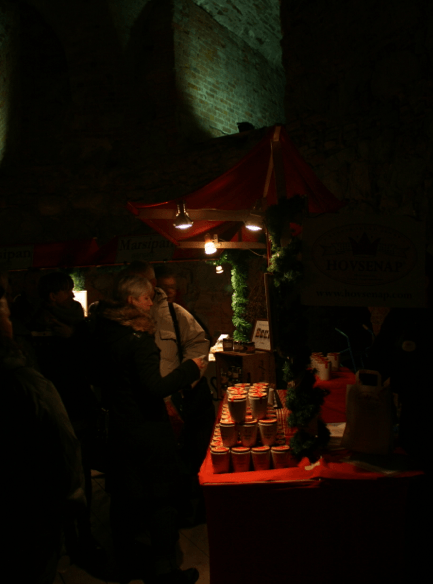 The old cellars of the castle had Holiday goodies table after table. 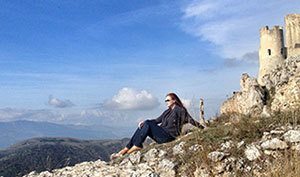 You could really get the old time feeling – the cellars were dark, and cold, stone walls exposed and you could imagine there could have been a Christmas market like that every year for the past 400 years. You can see from the picture below how dark it was. 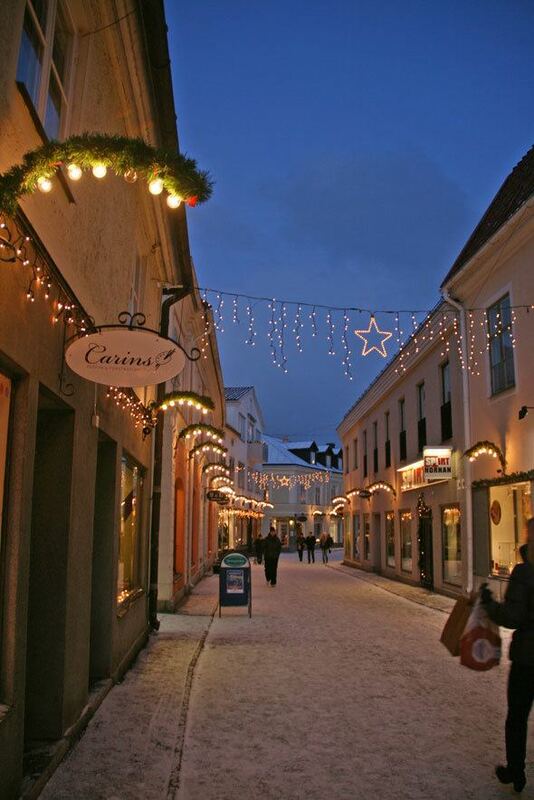 Whether you are feeling like you are transported back in time, or you feel like you are inside a charming Christmas Village or in one of those happy Christmas movies, the Scandinavian Christmas in Vadstena, Sweden, feels quite like a fairytale. Happy Holidays to you and your family, may you have magical moments wherever you are spending the Holidays! It looks soooo pretty there.